Translation is the process by which cells synthesize proteins. During the process, molecular machines called ribosomes use messenger RNA molecules that relay the genetic code from DNA to direct assembly of the amino acid building blocks that make up proteins. This is all tightly controlled to ensure that the correct proteins are synthesized at the appropriate time and in the quantities needed by the cell. Aberrant translation causes significant problems for cells and contributes to cancer and various neurological disorders (e.g., autism). Written and edited by experts in the field, this collection from Cold Spring Harbor Perspectives in Biology examines our current understanding of all aspects of protein synthesis and its control. The contributors describe recent insights into the fundamental steps in translation (initiation, elongation, termination, and ribosome recycling) based on high-resolution structures of the translational machinery. The signaling pathways and targets of translational control (e.g., initiation factors, mRNAs, and ribosomes) are discussed, as are the roles of riboswitches, processing bodies (P-bodies), stress granules, and various classes of RNAs (e.g., circular RNAs). Methods to study translation dynamics, including ribosome profiling, kinetic assays, and single-molecule and single-cell fluorescence imaging, are also covered. In addition, the authors examine translational control during early embryo development, stem cell differentiation, and memory formation. The deregulation of translation in cancer and neurological disorders, as well as the development of small molecules that target translation for therapeutic purposes, is also discussed. 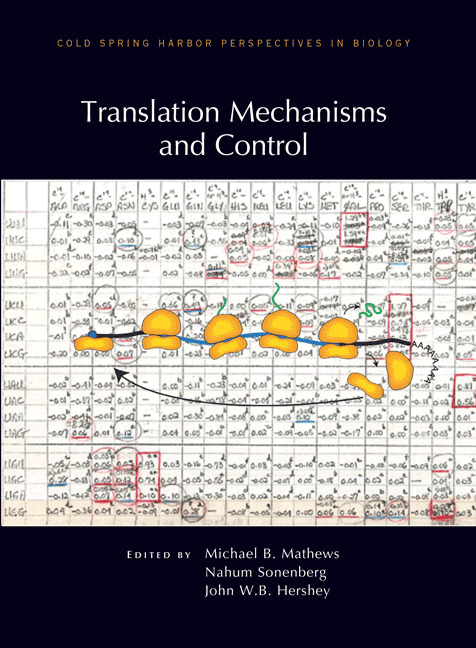 This volume is therefore an essential reference not only for cell and molecular biologists but also for cancer biologists and others who investigate human diseases associated with dysregulation of translation.